I’ve never met debut author Cassie Hamer but we’ve followed each other and chatted via social media for years so. I was delighted to hear she had a book deal. I was a little nervous about reading it as I wasn’t sure if it was going to be a genre with which I struggle (romance, for example) or (from the backcover blurb) going to dip into themes that don’t interest me (the competitive yummy mummy thing). However thankfully it was none of those things. I suspect it’ll be described as women’s fiction or general fiction, but it dips into an array of genres… with a mystery to be solved and a little romance thrown in. Hamer’s sharp and witty prose also mean there’s an element of humour added for good measure. The backcover blurb references mobsters and yummy mummies all of which would normally be a bit off-putting (for me) but I was very relieved that Hamer doesn’t take us down any farcical route. The plot itself isn’t comical, but she introduces sass and wit through her writing in a very light-handed way. It’s the type of writing I love (the inclusions of little comical ‘asides’) and though I’m really heavy handed with them in my own writing, Hamer (and her publishers I assume) achieve a good balance here. For example, a few items from Lisa’s pre-party spreadsheet…. Very Bridget Jones Diary-ish and (like I said), a style I love. I adored Lisa, our lead character. She’s an obvious ‘square’ and Hamer unabashedly reminds us of that on a few occasions. We learn why though… she had to take responsibility for her sister from a young age and she takes her responsibilities seriously. And her sister Jamie is equally likeable and believable. There’s romance afoot for Jamie and I very much appreciated that Hamer kept things realistic and Jamie was brutally honest in her feelings and behaviour. Very real and relatable. I also really liked the character of Ellie. She’s a pivotal character but probably not seen as a main character (MC) but Hamer gives us enough of her – through her behaviour and conversations that I absolutely adored her. I get why Lisa would not want to give her back. As I said, Hamer happily takes quite a light touch to the perfect parenting wars, posh schools and yummy mummies. It’s there and I had to laugh at the opening antics of the party Lisa and husband Scott attempt to throw for 5yr old Ava. And yes, WTF were they thinking inviting 32 children? I also sniggered at their horror of parents just dropping their kids off and not staying to help supervise / partake in the adult food Lisa had specifically made. I don’t have kids but KNOW kids’ birthday parties and social events are fraught! Hamer very cleverly leads us down the garden path in the search for Ellie’s mother Missy and the secrets she’s keeping. Early on I was worried the answer was going to be startlingly obvious. But it wasn’t. Instead that particular story arc offers a nice twist that’s also deftly managed. A couple of the support characters are a little cliched, but in a nice way: including a seemingly snobby but actually quite nice wealthy mother as well as a lycra-clad rude disinterested mother. I loved a scene (for example) where we’re reminded of kids’ innocence and their ability to forgive and forget; when Lisa and the disinterested mother are called to school after their kids get in a fight. The way the kids earnestly apologise and offer up hugs to each other is so very touching. I obviously very much enjoyed this book by Hamer. I knew she was a good writer but the plot and complex, relatable and likeable characters most definitely exceeded my expectations and I look forward to what comes next. 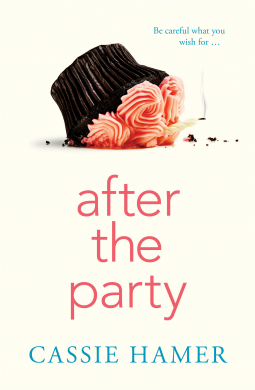 After the Party by Cassie Hamer will be published in Australia in mid February by HQ Fiction (Harper Collins).